I suppose this post could be subtitled something like: “And you thought this blog was gonna be all Victorian Garb” 😉 Nope! To be truthful, while I was in the midst of all that hand sewing needed to construct my elliptical hoop skirt, I was watching a lot of TV. No, I take that back, while I was doing all that hand sewing, I was watching a LOT of My Little Pony: Friendship is Magic. “……….Wait, what? But you’re a grown woman, Melinda,” I can hear you thinking – except not, because if you knew me you’d not be too surprised. But if you don’t know me, you would have a right to think I might be a little off my rocker for spending hours and hours watching a show intended for little girls. Except I’m not! Not in this context, anyhow. As a child of the 80’s (and a child of parents who loved thrift stores and garage sales,) I was bit by the My Little Pony bug pretty dang early and at one point I had amassed a pretty large collection of G1 Ponies. 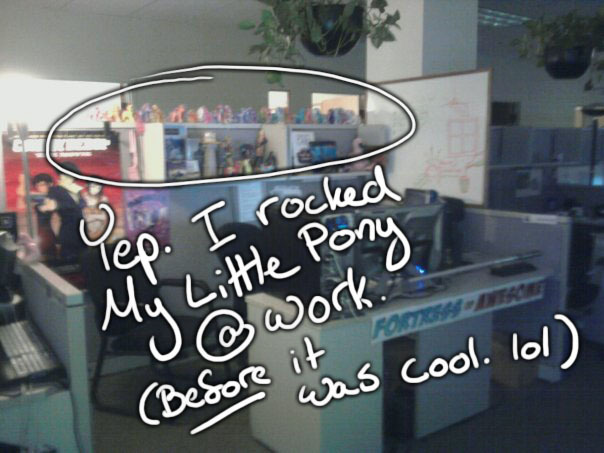 While I wouldn’t consider myself an active collector anymore, when people heard My Little Pony news, they’d pass it on to me. 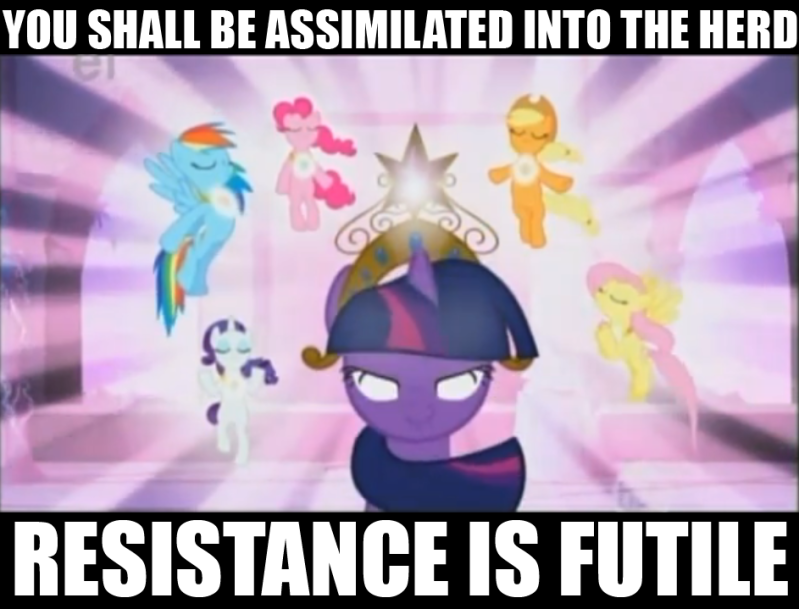 And so I happened to be passed the link to the first episode of Tara Strong’s 2010 reboot of My Little Pony a few days after it first aired on The Hub. And hoo boy, was I expecting a train wreck! The ’90’s and ought’s have NOT been good to My Little Pony. But as I watched, I found myself enjoying the show. The art direction was fantastic, the characters likeable, and the plot had finally re-expanded past G2 and G3 conventions of “Oh NO! The Princess’s cupcakes got crushed! What’ll we dooooo?!? !” – I was hooked. And so were a lot of other people. 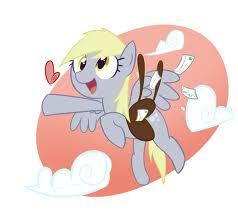 And so, by this internet following, I discovered a little pony by the fan name of Derpy Hooves. 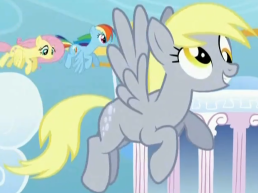 A product of either animation error or mischievous layout artist, Derpy was so dubbed for her ridiculously askew eyes. Who was this background pony? What could her role be in Ponyville? Was she a total nutter or merely temporarily lost in her own quirkiness? 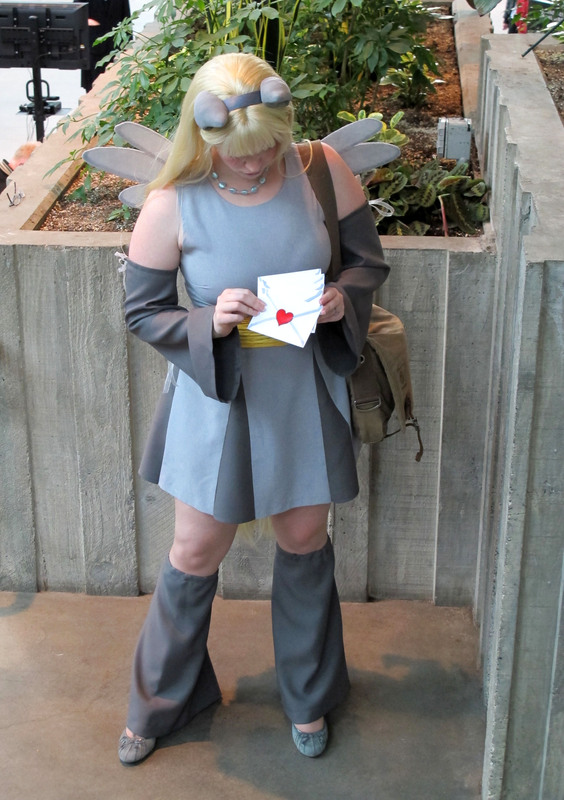 She quickly became an internet fan favorite, and I realized what I wanted to do for the rapidly approaching Emerald City Comic Con. The convention that was 3 days away. With such little time to prepare, I knew I’d have to take some short cuts. My first order of action was to find myself a base to work with. I knew I wanted my costume to be gray with yellow/orange accents, but past that I was at the mercy of the thrift store. I came home with a pair of gray corduroys, gray pumps, a yellow blouse, and a gray dress that was about a size or two too small in the hips. 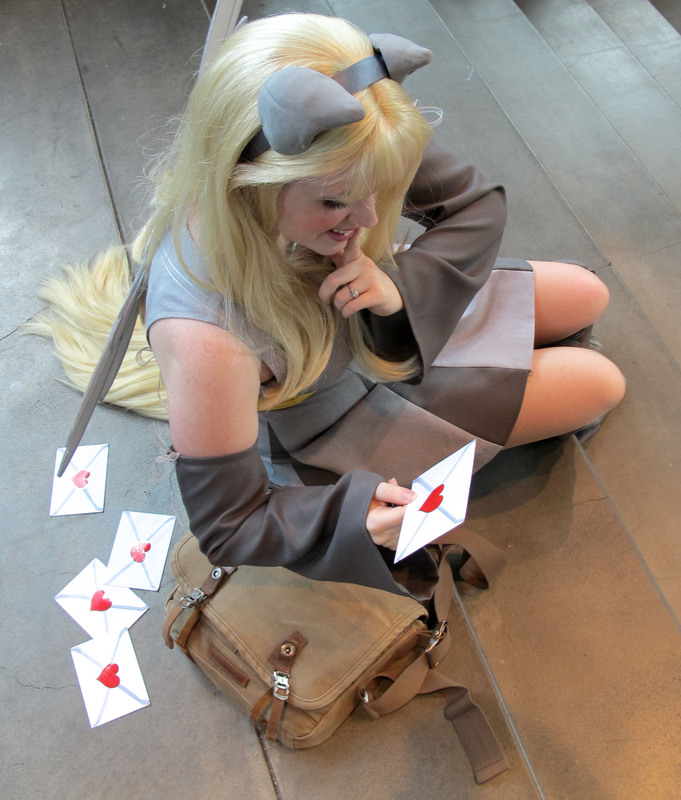 I got super lucky with the wigs used for the head and tail – thank goodness that Derpy is a blonde, and huzzah for the Pacific Northwest Costume shop in Redmond. 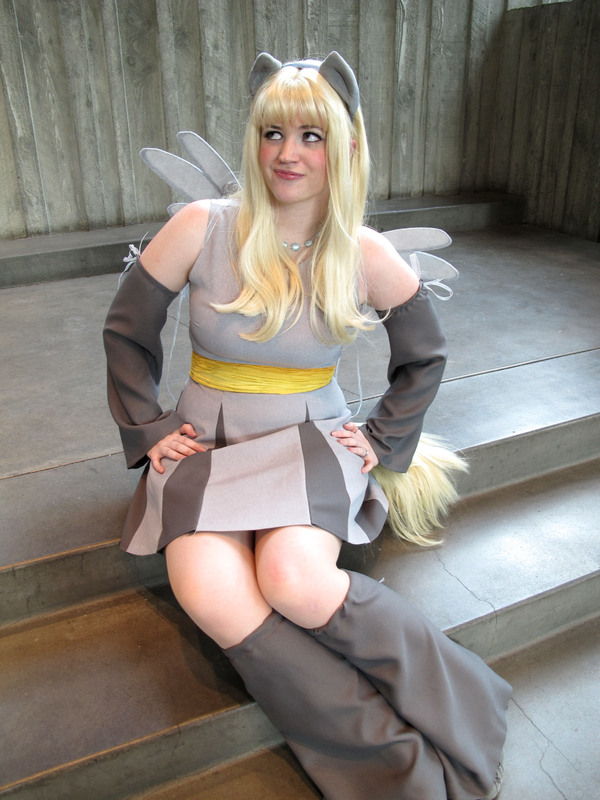 They helped me find a good enough quality wig that matched Derpy’s mane, and a cheap-enough-that-I-wouldn’t-mind-trashing-it matching blonde wig for Derpy’s tail. The wig for her tail began life as one of those long blonde hippie wigs with a sewn on headband. 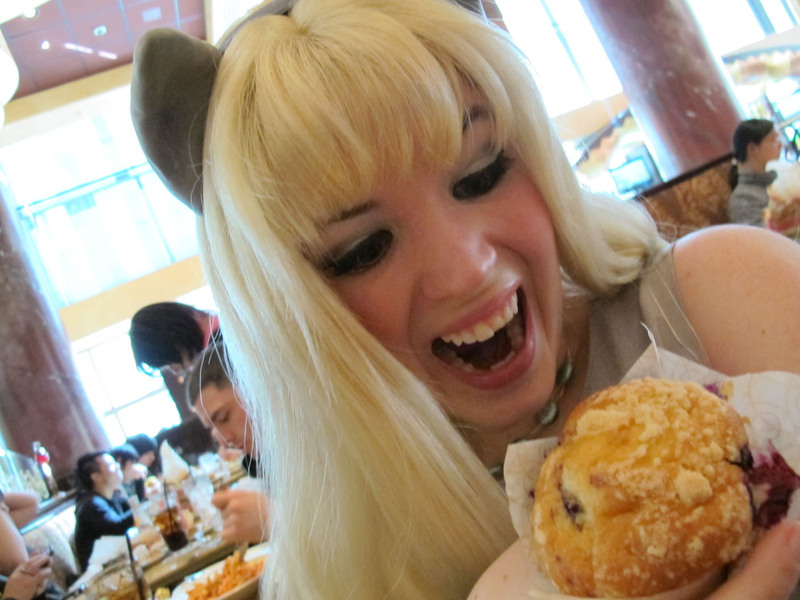 I removed the headband, and started gathering the wig around the skin top into a ball using a needle and thread. And a little bit of hot glue. I attached the compacted wig ball onto a piece of gray felt for stabilization, and attached a giant safety pin so that I’d be able to pin the tail onto my costume on top of the zipper up the back. I finished the tail up with a choppy haircut, and that was that! While searching at Jo Ann’s for fabric, I noticed some blue glass beads that reminded me of Derpy’s symbol. I strong 7 of them onto some left over ribbon for a quick and easy necklace. The ears are made of Crayola Model Magic in gray. I split one package into two balls, and shaped an ear out of each ball, and hot glued them to a silver cloth covered headband. 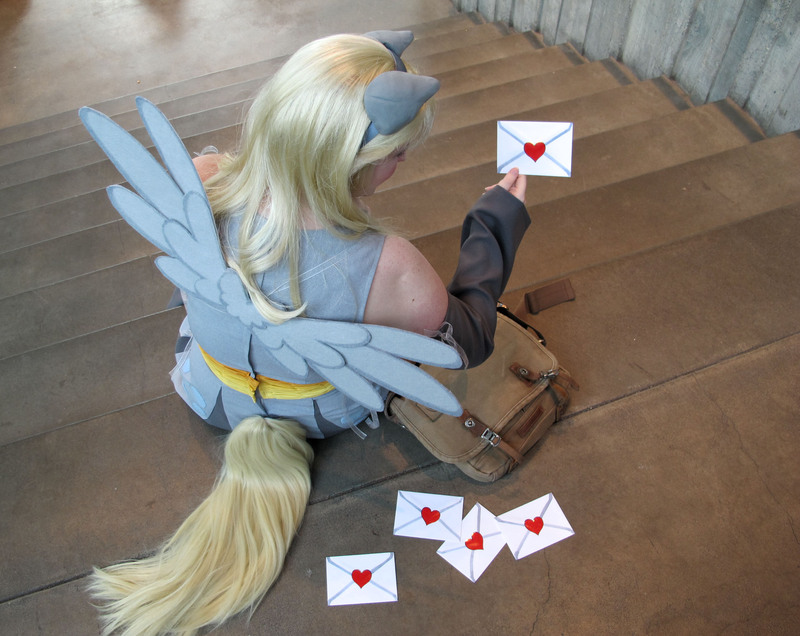 In fan cannon, Derpy Hooves is the mailpony of Ponyville, so of course I had to have letters to deliver. Thankfully I had an old bag from college that matched the brown mail bag she’s often drawn with, so all that was left was to make some letters. I used my trusty gray copic marker to outline the seams of each letter envelope, and finished each letter off with a heart shaped sticker. Moving Up: Corsets and Bloomers, Oh My! Working on the bowtie and bolero for my wedding had been a great kick start project for reteaching myself how to sew. It had gotten me to blow the dust off my inherited Bernina 1130 sewing machine, and reacquainted me to reading sewing patterns. Conveniently, Steamcon was only a month away! Steamcon is a Steampunk convention, held once a year outside Seattle, Washington. My friend Jean had just finished up making her first corset for the convention using the TV110 1880’s Corset pattern from Truly Victorian. 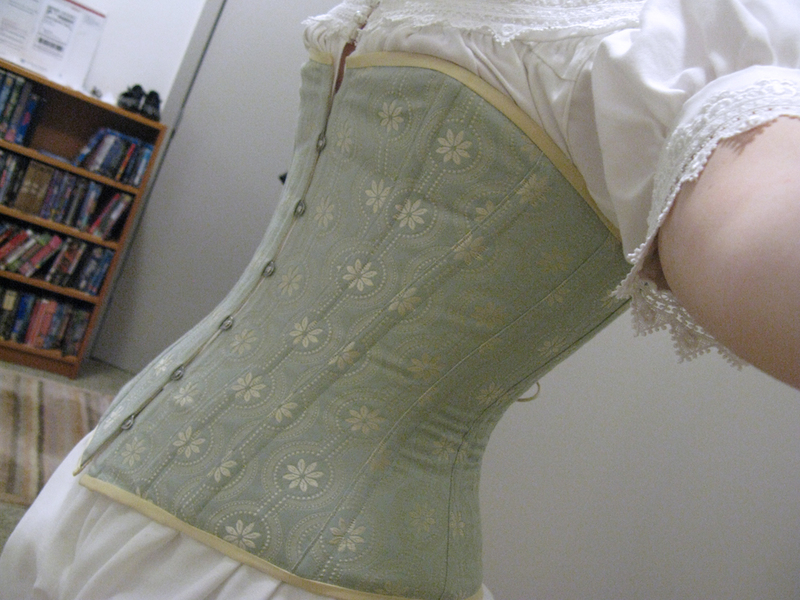 Jean’s corset looked fantastic, so with a bit of help pinning and fitting, I set to work on making one for myself. The chemise and drawers were made using Simplicity 9769. This pattern was great in terms of long term strength – there are no raw edges on the chemise because every seam is flat felled, but I do wish the sleeves were handled differently. They’re lovely, but they have a lot of bulk. I may make a new sleeveless chemise someday. The lace is actually multiple pieces layered on top of each other to make a wide band around the neckline and sleeve cuff.